The Official site for all the information you need about BINGO - The Winning Musical! Learn about the show and how to license it for your theatre. 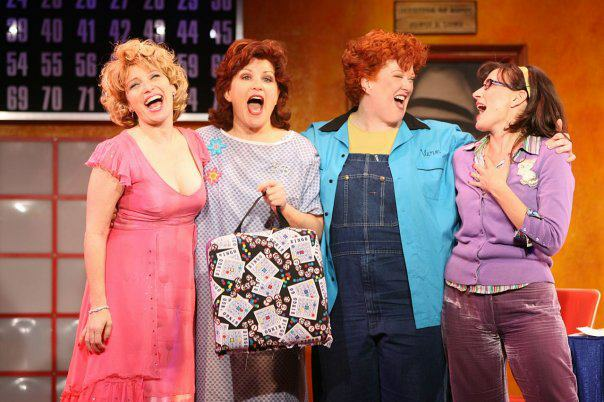 Liz Larsen, Klea Blackhurst, Liz McCartney, & Janet Metz in the Original 2006 Off-Broadway production. Welcome to the website for BINGO - The Winning Musical! BINGO enjoyed a very successful Off-Broadway run in 2006, and it has been winning over audiences across the globe ever since! BINGO is a splashy, zippy, fun new musical comedy that is perfect for theatres, schools, and community organizations looking to produce a small musical with a big heart. BINGO is about a group of die-hard bingo players who stop at nothing to miss their weekly game. In between the number calling, strange rituals and fierce competitions, love blossoms and long lost friends reunite. These lovable characters spring to life with a smart, funny script and bouncy, hummable score. Audiences will be laughing in the aisles when they aren't playing games of bingo along with the cast! We invite you to peruse this website to learn more about the show, read reviews, see production photos, watch video clips, hear music and find licensing information!